STS-114 commander Eileen Collins will make her fourth spaceflight aboard the space shuttle Discovery. CAPECANAVERAL, Fla. - With an exact launch date for their STS-114 mission still upin the air, seven space shuttle astronauts are hanging tight here at NASA'sKennedy Space Center (KSC), the spaceflight's commander said in a statementreleased Saturday. 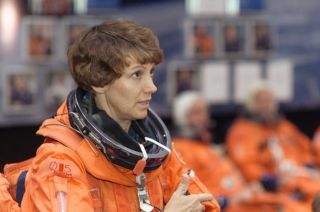 "Mycrew will remain in quarantine for the near future, maintaining our proficiencyfor this mission," said veteran astronaut Eileen Collins, commander of STS-114mission aboard the shuttle Discovery, in the statement. "We are keeping inclose touch with the troubleshooting plan; we have confidence that the bestpeople are working it." Shuttleofficials said that they may be able to launch Discovery late nextweek, but only if engineers get lucky and are able to find and fix thesensor system glitch soon. But that's not set in stone, and launch officials planinstead to launch the shuttle mission four days after a fix is made, theyadded. Twelveteamsof engineers gathered from across the country are working through the weekendto solve an external tank fuel sensor anomaly that cropped up during Discovery'sJuly 13 launch countdown and forced mission managers to scrubthe attempted space shot. But on Friday, shuttle program managers said theystill did not know if the glitch was with the fuel level sensor itself, thecomplicated electronics box it reports to aboard Discovery or the lengthywiring that runs between the two. Collinssaid the plan developed by engineers to track the glitch "is impressive, and weare very proud of the work they are doing!" Collinsand her six STS-114 crewmates were strapping into their seats aboard Discoverywhen flight controllers scrubbed the launch attempt. Aliquid hydrogen fuel level sensor near the base of the orbiter'spropellant-filled external tank had failed a standard countdown test, in whichall four of the sensors are forced to falsely report 'dry' indicating an emptytank. Thefaulty engine cutoff (ECO) sensor reported a 'wet' reading, or a full tank. Allfour of the sensors must perform properly in preflight checks in order tolaunch, since they track dwindling fuel levels during launch and allowDiscovery's main engines to shut down before running out of fuel. If theengines continue to fire without propellant, it could spell disaster for the mission. NASAexperienced anomalous readings from engine cutoff sensors in a separateexternal tank in April, when pad engineers testfueled the 526,000-gallon tank with its liquid hydrogen and liquid oxygenpropellant. After an initial investigation and secondtanking test yielded no answers, shuttle official labeled the incident an "unexplainedanomaly." They later switchedDiscovery to its current external tank, which bears an additional heater toprevent extensive ice formation. NASA'sSTS-114 mission is the agency's first attempted shuttle flight since the 2003Columbia disaster that destroyed on orbiter and killed its seven-astronaut crewas they reentered the Earth's atmosphere. The STS-114 flight is expected totest a series of new orbiter inspection and repair techniques, deliver muchneeded supplies to the International Space Station (ISS) and validate safetymodifications to shuttle external tanks. NASAhas until July 31 to launch Discovery's STS-114 mission and still meet thelighting conditions needed to photograph the orbiter's flight, external tank separationand tile-covered underside as it docks at the ISS. If the agency fails tolaunch by that date, it will have to wait until a Sept. 9-24 window to launchwith proper lighting. "While the launch delay is disappointing, we have strong confidence that themission will launch safely and successfully, and we fully support our NASAleadership for taking the time required to understand the problem," Collinssaid.